“Relative weaknesses” for a given individual. How do we Determine Factors? Determination of Premorbid Abilities – use the “best performance” method. The neurological exam is another effort at looking for a footprint of pathology, that something about the way in which the brain is functioning is not proper. A full neurological exam includes not only the classic tests to determine whether the nervous system is working properly, but also a rudimentary assessment of cognitive function and most important, a clinical interview. Yet far too often in concussion cases, the exam is limited to a quick check for focal neurological deficits. Such an exam will rarely identify the type of deficits typically associated with a subtle brain injury, although the diligent neurologist may uncover focal deficits, which were missed at the time of the injury. Sadly, the one focal deficit which is most likely to be effected by a concussion, the sense of smell, is the one which is least often checked. The neurological exam is often thought of as a objective evaluation as to whether the nervous system is working properly. 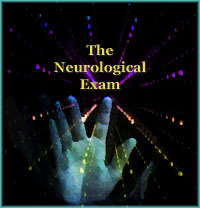 While this conception may often be the way in which the exam is used for diagnostic purposes, the neurological exam is no more objective than other footprint type evaluations, nor is the good examination, limited to a physical exam.